HP OfficeJet Pro 6962 is an energy efficient printer which uses inkjet technology for performing printing, scanning, copying and faxing the documents. The printer belongs to bulky printers category, yet it has small footprints with dimensions of 46.3 x 39.0 x 22.8 cm. 4-individual HP OfficeJet Pro 6962 ink cartridges deliver vivid colors and sharp black text on every printout. The separate ink cartridges allow replacing only the expended cartridges, this further reduces the maintenance. In addition to this, the printer offers business quality print with 600 x 1200 dpi. The printer is more productive and has a good printing speed of 16ppm and 9ppm for monochrome and colour printouts. The printer is compatible with the various media type, hence, printing speed may vary with paper used. This printer is versatile with various series of Linux, Windows, and MAC operating systems. To add more flexibility to its functionality, the printer allows multiple connectivity options, including HP ePrint, Apple AirPrint, Mopria, and wireless direct printing. The printer is backed with the 35-page automatic document feeder for the printing process. The OfficeJet Pro 6962 printer covers less space. It incorporates 4 individual HP OfficeJet Pro 6962 ink cartridges which provide good quality print and also reduces the maintenance cost. The printer is versatile with multiple media and connectivity options. Hence, this printer is perfect for your office desk or small home printing tasks. How to fix the print quality issue of white lines in the text or graphics in the HP OfficeJet Pro 6962 printer? Step 1: Make sure that the HP OfficeJet Pro 6962 ink cartridges are installed properly and no pollutant particles are present between the printhead nozzle. For Window 7 User: From start menu click, control panel and select devices and print. Right click on your printer model and open printer driver window. For Window 10 User: Click window tab and then click all apps. Open control panel in the window system. If you want to check the quality of the print, select print quality. Step 3: Check for the ink level of ink cartridges. If the ink level is low, replace the HP OfficeJet Pro 6962 ink cartridge. Access the printer driver window. Jump back to Step 2 to know about the procedure to access printer driver window. Click on the advanced tab and further click print options. According to your printing preference, select the type and click ok. Step 5: Check for the presence of dust, debris etc. near HP OfficeJet Pro 6962 ink cartridges area. They can also affect the print quality. Q. 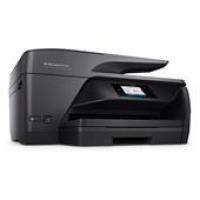 How much power does the HP OfficeJet Pro 6962 All-in-One printer consume? A. HP OfficeJet Pro 6962 consumes 1.21 Watt during sleep mode, 5.5 Watt when it is on standby and 27 Watt during operation. Q. What types of paper is the HP OfficeJet Pro 6962 All-in-One printer capable of printing on? A. This printer can print on paper types such as glossy paper, light-weight paper, matte paper, photo paper, plain paper, recycled paper and thick paper. Q. If I miss the delivery of my HP OfficeJet Pro 6962 ink cartridges, will you reschedule the delivery? A. All our orders are delivered by Fastway Couriers. They will try to make two deliveries to your door. If the delivery is unsuccessful after two attempts, the goods will be returned to their central depot or to our warehouse. Any delivery attempt after that will incur an additional charge of €4.95 inc VAT. You can contact us by telephone on 048 30833221 or email us at info@printerinkcartridges.ie to check the status of your order. Q. I have always used original ink cartridges for my printer. I am thinking of using compatible ink cartridges for the first time. Can you confirm that the use of compatible HP OfficeJet Pro 6962 ink cartridges will not cause any damage to my printer? A. Our compatible HP OfficeJet Pro 6962 ink cartridges will work absolutely fine and certainly not cause any damage to your printer. These compatible ink cartridges are FSC tested and are guaranteed to produce the same quality of output as original cartridges. Furthermore, all our ink cartridges come with a warranty and money-back guarantee, thus ensuring the quality of the products. Q. Do you sell printing paper on your website? A. Yes, we provide printing paper on our website. You can find our paper products on this link: https://printerinkcartridges.ie/stationery/paper.